Hello Loves! 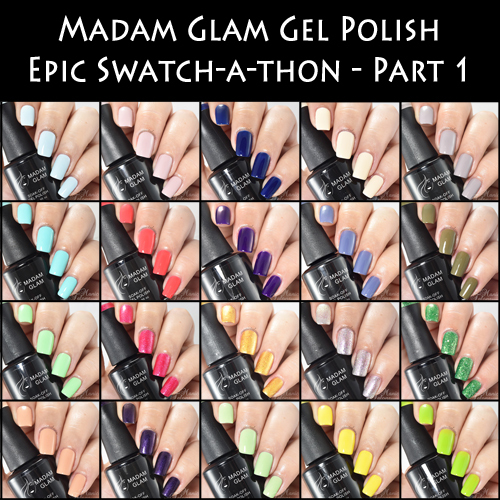 So, I've been working on an Epic Madam Glam swatch project. Basically, I'm working my way through their entire gel polish color line. I've swatched a good many over the past year, but I barely made a dent in their collection. So now I'm swatching like a mad woman to make it through over 300 gel polish colors! I think it was around 130 colors I hadn't swatched yet, and I'm 69 in at this point. I showed you the 10 One Step Gels a few weeks ago, so that leaves 59 that I have swatched but haven't shared with you yet. I feels like they are multiplying as I go and my "to swatch" pile keeps growing! So, let the Epic Swatch-a-thon commence! I'm going to break these into multiple posts to keep from completely crashing my blog. I'm also going to alter my typical review format a little just to make things easier. I mean, we are talking about 118 photos that are finished and ready to share with more being produced each week. lol So let's jump right in. These are in no specific order (well, they're alphabetically for the first few parts of the series just because I had them listed that way as I uploaded the pictures, but they'll become more random as the project progresses). Application/Notes: Flawless. This polish is nice and creamy, which allows for great coverage and application. She's opaque in two coats. Application/Notes: Flawless. Opaque in two coats. I love this one! It's a great color for my skin tone. Application/Notes: Application is very nice. Smooth and easy to apply with no shrinking. I did find I needed three coats for even full coverage, but that is common for me with polishes in this color family. You might be able to do two coats without issue. Application/Notes: Flawless application. Perfect coverage in two coats. Polish is creamy and smooth. Application/Notes: Average application. Polish is very creamy and stays where you put it. However, I did need three coats for flawless, opaque coverage. Application/Notes: Flawless! Perfect coverage in two coats with a slightly glassy finish. Description: Muted, blue toned, light purple cream. Application/Notes: Creamy polish. Smooth application with two coat coverage. Application/Notes: Perfection. Smooth and easy with a deep, wet look. Opaque in two coats. I didn't think I would like this one since I'm not usually a fan of Earthy greens, but I love it! 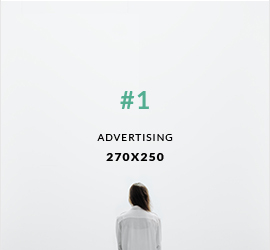 Application/Notes: Nice. Smooth and creamy. Perfect coverage in two coats. Application/Notes: Polish is thick and offers nearly full coverage in one coat. Two coats is perfect. No shrinking or streaking. It doesn't get much better than this. Application/Notes: Interesting. Coverage is nice, but the glitters make things a little tricky. I found I had to stroke over the nail several times for even glitter distribution, which left marks in the gold shimmery base. Opaque in two coats, but I needed three because of the glitter to get a smooth finish. Even with the third coat and top coat, the polish appears slightly textured. 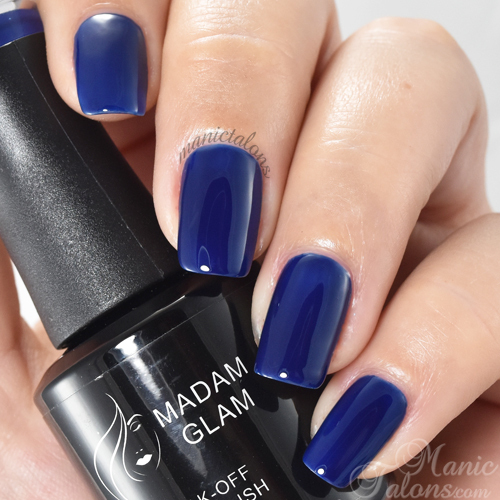 Application/Notes: Can be worn as a standalone polish or as a topper. I swatched three coats here and you can see slight VNL. Application is smooth and easy. No fighting at all when wearing alone. Over a base color, you may need to smooth over the nail a few times for even distribution. But look! Just look! Isn't she gorgeous???? Application/Notes: Average application. Glitter distributes easily over the nail. There is some shrinking at the dips as is to be expected with a jelly finish. Almost paque in three coats. I should note that this one was difficult for me to photograph. The color looks right on my screen, but the vibrancy is a little off. It pops much more in person. Application/Notes: Applies nicely. No shrinking or fussing. Polish is nice and creamy and is opaque in two coats. Application/Notes: This polish is a huge hit at the salon, despite being a little difficult to apply. It does have a bit of shrink back, but it is manageable in three coats. The glitters have a little bit of a copper color shift as you can see on the index nail in the first shot. Gorgeous polish - well worth a little extra time for application. Application/Notes: The polish is thick and creamy. Application is smooth, but be careful if you have to stroke over the nail. It doesn't level quite as nicely as some and can leave brush dents as you can see on my index nail. Application/Notes: I love this yellow! If you're looking for a bright yellow that doesn't cross into highlighter or neon territory, this is is. Application was a breeze, which is odd for yellows. I did need three coats for full opacity, but experienced no shrinking or streaking. Application/Notes: While this isn't really a color I gravitate toward, I can appreciate the brightness and pop. Application is average. I needed three coats and feel that four might have been better. You can see some areas are a little thin around the cuticle line in the pictures, but it was not noticeable in person. Also, if you can't the polish you're looking for on their website, it might be out of stock. They take listings down when they sell out and put them back up when they restock. So keep checking back if the polish you want isn't listed. :) Since the listings tend to come and go with availability, I didn't direct link each color throughout the post this time. That's the same thought I had. Thanks for these lovely swatches! I have really slow internet and it loaded just fine for me - as I scrolled down to read all of the images were there. What an epic project! Gosh, I just signed up for Madam Glam's monthly "gel box" deal, so this swatch post could not have been more on time for me! Extremely helpful Michelle, thank you!! So so helpful, thank you for doing these! Love your swatches. :) Can't wait to see the next parts. Thank you for these!! Have you tried their peel off base coat? All three parts are incredible. Thank you for this epic job! Do you use a top coat? I'd assume so, but you mention the final finish sometimes, so I wondered. I'm still alive and kicking!! !